Received June 21st, 2011; revised July 22nd, 2011; accepted August 20th, 2011.
and kcat were 0.07 mM and 5.73 × 106 - 5.95 × 106 min–1, respectively. to a level less than PDMS . shows no adhesion or activation of human platelets [6,7]. in the core when placed in water. useful for biomedical materials such as artificial veins. nized water was used for all experiments. G2000HXL), using TOSOH LC-8020 GPC. Yield: 68.3%. 3.55 - 3.58 [m, 4H, -OCH2-], 4.18 - 4.20 [t, 4H, -COOCH2-]. solvent of dichloromethane and hexane (50/50 vol%). 7.86%, Found: C, 60.46%; H, 9.06%; N, 8.08%. ness of 0.06 - 0.08 mm was obtained. were added, and the mixture was shaken at 37˚C for 2 h.
cording to the method mentioned above. Scheme 1. Preparation of amphiphilic block polymers. on the higher monomer reactivity of Boc-LysAA-OtBu. Table 1. Preparationa) and Charactarization of poly(BocLysAA-OtBu-b-DMS). 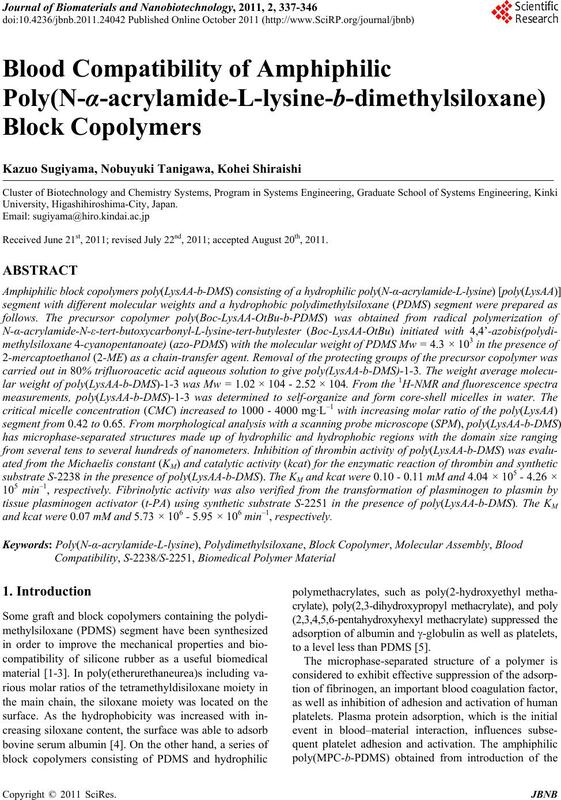 Mw of block copolymers were estimated from GPC; d) Ref.12. = 1.0 × 10-4 mg·L–1. μmol·L–1, λEX = 364 nm, CMC = 1000 mg·L–1. in order to confirm its microphase-separated structure. Figure 4. SPM images of poly(LysAA-b-DMS) films. poly(LysAA-b-DMS)-1-3 as shown in Scheme 2 . C-terminal of the residual arginine to hydrolyze . Scheme 2. 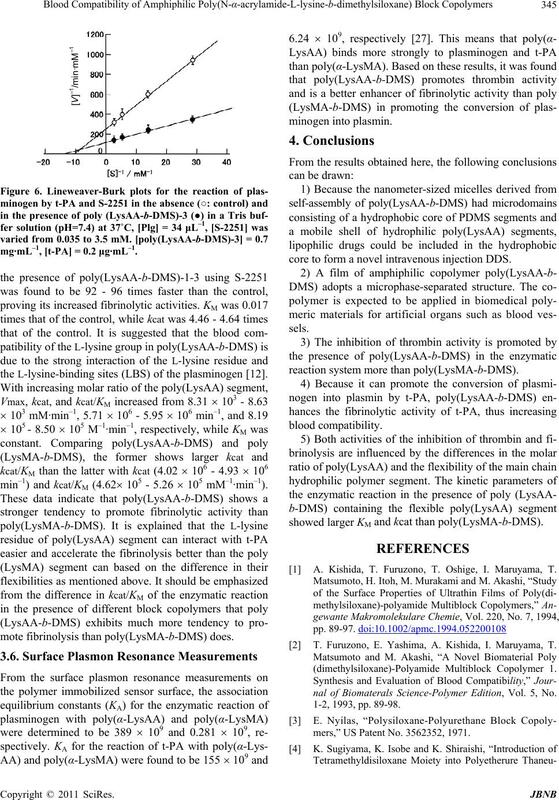 Enzymatic reaction of thrombin/S-2238 and plasminogen /S-2251 in the presence of poly(LysAA-b-DMS). from 0.05 to 0.5 mM. 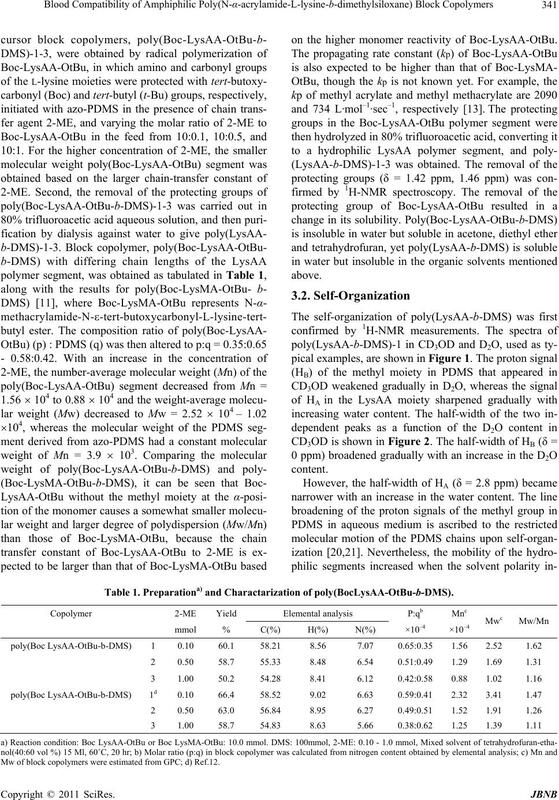 [poly(LysAA-b-DMS)-3] = 0.7 mg·L–1. 105 min–1) and kcat/KM (2.43  106 - 2.31  106 mM–1·min–1). 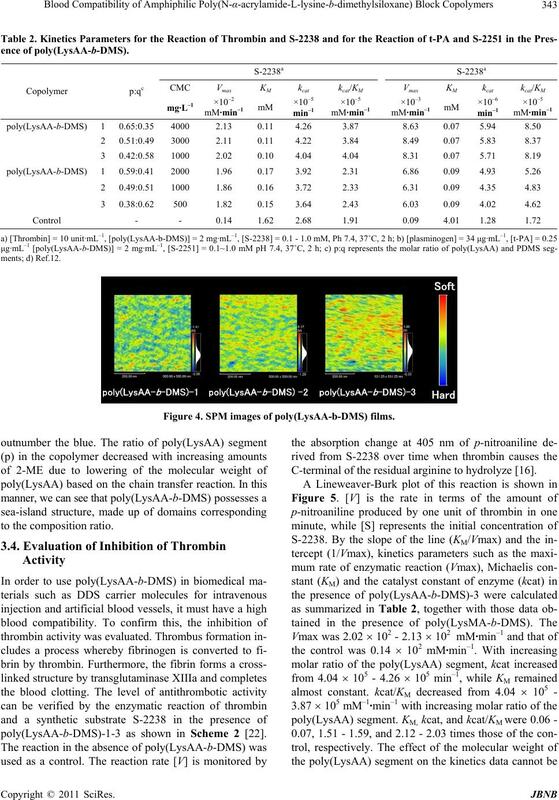 promote thrombin activity than poly(LysMA-b-DMS). could inhibit the thrombin activity. reaction of plasmin and a synthetic substrate S-2251 . 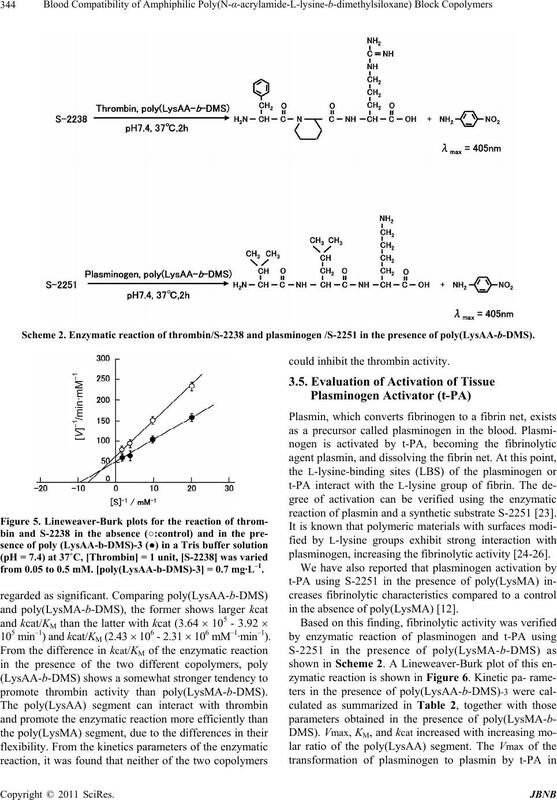 plasminogen, increasing the fibrinolytic activity [24-26]. in the absence of poly(LysMA) . mg·mL–1, [t-PA] = 0.2 μg·mL–1. the L-lysine-binding sites (LBS) of the plasminogen . min–1) and kcat/KM (4.62 105 - 5.26  105 mM–1·min–1). mote fibrinolysis than poly(LysMA-b-DMS) does. core to form a novel intravenous injection DDS. 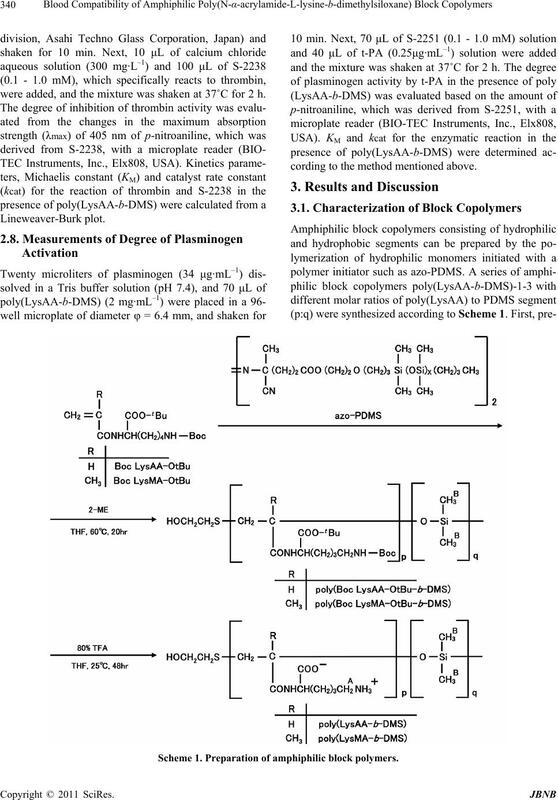 reaction system more than poly(LysMA-b-DMS). showed larger KM and kcat than poly(LysMA-b-DMS). 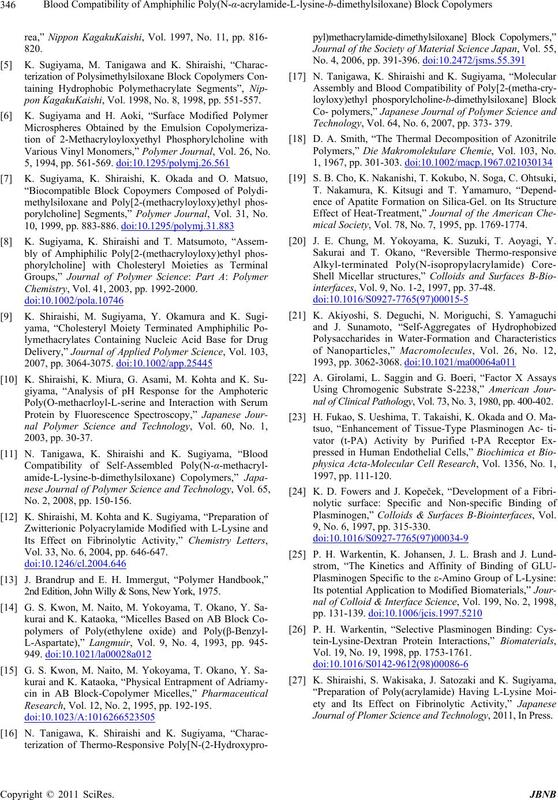 A. Kishida, T. Furuzono, T. Oshige, I. Maruyama, T.
 T. Furuzono, E. Yashima, A. Kishida, I. Maruyama, T.
nal of Biomaterals Science-Polymer Edition, Vol. 5, No. mers,” US Patent No. 3562352, 1971.
pon KagakuKaishi, Vol. 1998, No. 8, 1998, pp. 551-557. 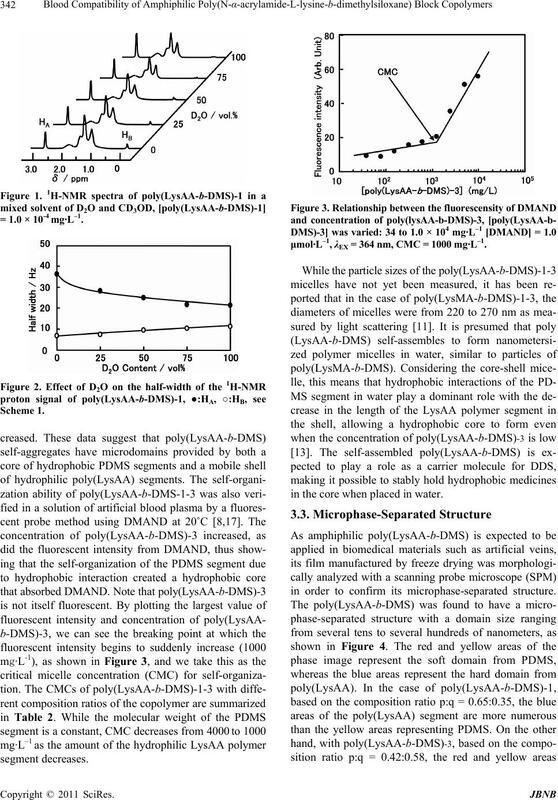 Various Vinyl Monomers,” Polymer Journal, Vol. 26, No. 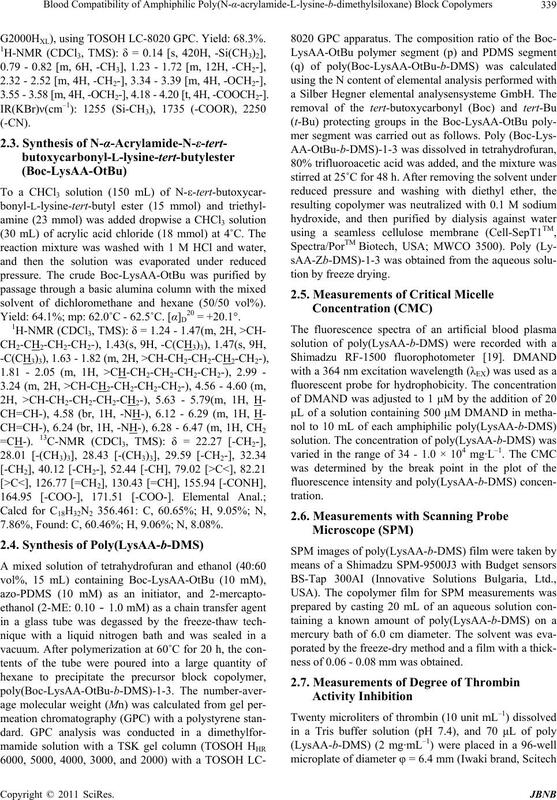 porylcholine] Segments,” Polymer Journal, Vol. 31, No. Chemistry, Vol. 41, 2003, pp. 1992-2000. No. 2, 2008, pp. 150-156. Vol. 33, No. 6, 2004, pp. 646-647. 2nd Edition, John Willy & Sons, New York, 1975. Research, Vol. 12, No. 2, 1995, pp. 192-195. Technology, Vol. 64, No. 6, 2007, pp. 373- 379. 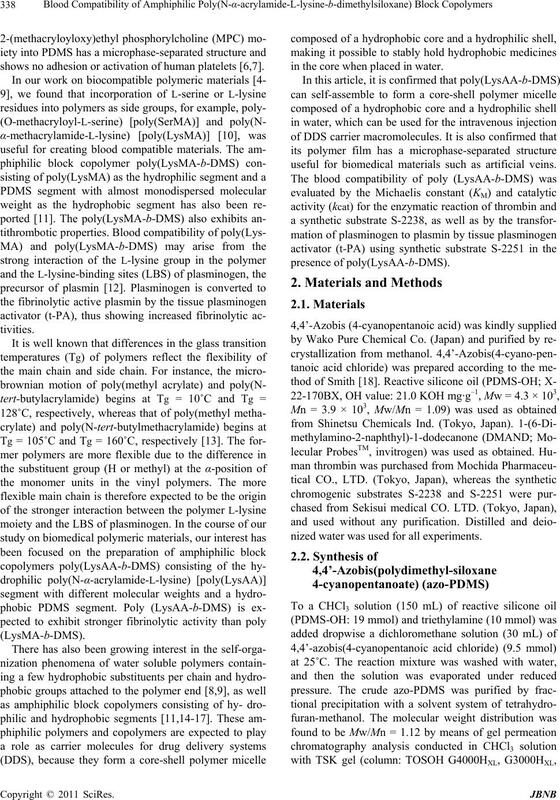 Polymers,” Die Makromolekulare Chemie, Vol. 103, No. mical Society, Vol. 78, No. 7, 1995, pp. 1769-1774. J. E. Chung, M. Yokoyama, K. Suzuki, T. Aoyagi, Y.
interfaces, Vol. 9, No. 1-2, 1997, pp. 37-48.
nal of Clinical Pathology, Vol. 73, No. 3, 1980, pp. 400-402. Plasminogen,” Colloids & Surfaces B-Biointerfaces, Vol. 9, No. 6, 1997, pp. 315-330. Vol. 19, No. 19, 1998, pp. 1753-1761. Journal of Plomer Science and Technology, 2011, In Press.